Review number 1 is for The Pericles Commission. What makes this interesting is that it's reviewed by Alun Salt, who's a for-real archaeoastronomer, which has to be one of the cooler job titles around. Alun helped me out with some dates for the third book, because the ancient Olympics was scheduled to run according to various phases of the moon around the summer solstice. So he was able to give me information on how much light there would have been to see by at the time of the murder. Alun's done some very interesting research on the placement of Greek Temples relative to the sun, which I blogged about some time ago. So Alun looked at my first book very much from the viewpoint of someone who knows the period in minute detail as a professional. Here's his review. He raises quite a few points that I haven't seen elsewhere. I won't clutter this post with detailed talk about them. Only insane authors argue with reviews, and in any case there's nothing to argue with, but I'll definitely be back to discuss some of the things he mentions in a later post. Review number 2 is for The Ionia Sanction. But not the book; it's for the audio version. Dreamscape is an audio book producer in the US. They hired an American actor to read the book end to end. I hope he liked it, because he had to read every word very clearly! 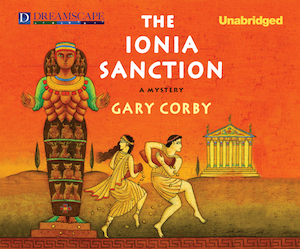 The audio version of The Ionia Sanction is now for sale, and thanks very much to Dreamscape for doing it. The audio review was written by Bernadette at Fair Dinkum Crime, who very clearly is not American, and I was interested to see how that affected the listening. "Only insane authors argue with reviews..."
No truer words my friend! Sorry Gary, didn't mean to have any spoilers. I have changed the offending portion to make it more vauge. Thanks Bernadette! It's so hard to write a review without them, I know. Yes. I've been blessed with uniformly positive reviews, so it's never been a problem for me, yet every now and then I'll see something that bemuses. Someone once wrote that my hero Nico was too stoic, which I thought odd, considering he never passes up an opportunity to whine about his numerous injuries. But if that's the way the reader saw it, then that's how they saw it. That's a great review by Alun Salt, Gary. Congratulations.